Two articles caught my eye today. This one, from accuweather.com ‘s Meghan Evans, discusses their current seasonal forecast this winter. Due to an expected weak to moderate El Nino condition the mid-Atlantic and parts of New England will see above-average snowfall while the upper Mississippi Valley and high plains will see less than usual. 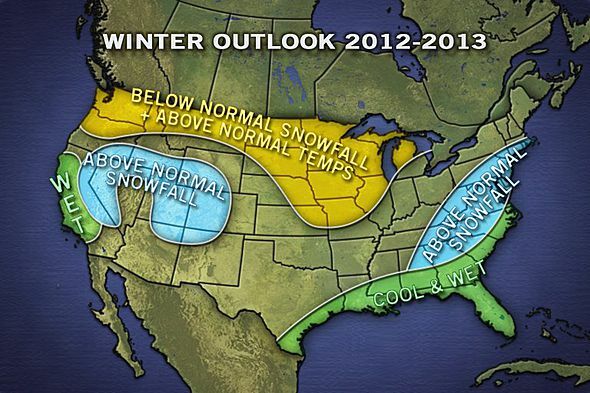 From accuweather.com, their 2012-2013 winter outlook. Another, from NOAA, is their updated hurricane season forecast. The forecast increases the expected range of named storms (reach at least tropical storm strength) to 12-17. This is up from 9-15; and the increase comes despite the expected El Nino, which typically inhibits tropical cyclone development. So many questions? How do meteorologists make seasonal forecasts? What is El Nino? How does it impact these seasonal forecasts? Let’s start with El Nino, an honestly it’s a huge topic. For the purpose of this post I’ll keep it real brief. For a more thorough (and technical) overview refer to this overview from The International Research Institute for Climate and Society. El Nino, and its opposite phenomenon La Nina, involve water temperatures in the Pacific Ocean. When the water around the equator in the eastern Pacific is above average, we call it El Nino. When it’s below normal, it’s La Nina. The conditions are created by the easterly winds over that region of the ocean and the full cycle lasts 3-7 years. The differences are only a few degrees Centigrade but El Nino and La Nina have effects on the climate system that are significant and worldwide. Again, the mechanisms for these teleconnections are a little involved for this blog, but if you’re interested you can take a look at NOAA’s El Nino impact page here. 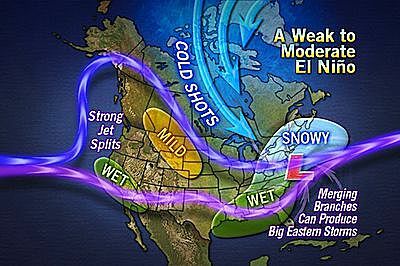 Because of AccuWeather’s article, lets take a look at how El Nino conditions typically alter winter weather in North America. Again from AccuWeather, the typical impacts of a weak to moderate El Nino on the Northern Hemisphere winter. The merging jet stream branches tend to create big storms that is the reason for the above-average snowfall prediction. Modern-day seasonal forecasting is more than just The Farmer’s Almanac. Meteorologists are beginning to figure out how to predict seasonal rain and snowfall, temperature anomalies, and tropical activity. I’ll admit the science is still far from reliable, and any seasonal forecast should be taken with a grain of salt, but seasonal forecasts are very important for energy producers, insurance companies, and the agricultural community. When meteorologists sit down to develop a seasonal forecast there are several things they consider. The first and foremost is what we’ve been talking about already; El Nino and La Nina conditions are highly influential on weather in North America and very reliable indicators of a season’s weather trends. Other climate patterns are factored in as well, and for some regions their impacts can be stronger. Such patterns include the Arctic Oscillation, Madden-Julian Oscillation, and the North American Oscillation. Such oscillations have time periods from months to decades. Temperature anomalies associated with a positive Pacific/North American (PNA) pattern. I found an excellent source of information on all of the patterns from The State Climate Office of North Carolina. (who knew!) Although some of this may be on the technical side, I highly suggest the reading. All of these patterns impact different aspects of the climate system. Some are more important for seasonal temperature and rainfall forecasts, others are used to predict hurricane totals, but all are considered. Often a forecaster will look back to find a previous year with a similar setup; it’s no guarantee but similar setups will tend to produce similar results. These are called analog years. So what else? Unfortunately it’s climate change. July 2012 was the hottest month on record for the continental US we’ve been hearing about record highs a lot these days. On August 1st I had a post on climate change and western droughts; we expect such droughts to become more prevalent over this century and that will have to factor into seasonal forecasting. Similarly, other regions will become wetter and most regions will get noticeably warmer. Warmer temperatures also have an impact on seasonal forecasts for the tropics, where warmer waters will give tropical storms more energy. Both articles I introduced at the beginning of this post discuss El Nino. How exactly is it involved? The snowfall prediction we’ve already touched on, El Nino tends to cause a split in the jet stream over the North American continent. The point where they join typically sees large storms; and with incursions of Arctic air they’ll be snow storms that can dump large amounts of snow. In the other article, NOAA’s updated hurricane forecast, El Nino is actually a mitigating factor. The hurricane season should be more active DESPITE El Nino, which inhibits tropical cyclone formation by increasing wind shear. (See August 7th’s post, Ernesto and Tropical Storm Conditions to learn about hurricanes and wind shear) The reason for the increase is a favorable overall pattern and above average ocean temperatures.